The kitchen is the heart of your home. No longer just a place for cooking and washing up, it’s become one of the key entertainment areas. 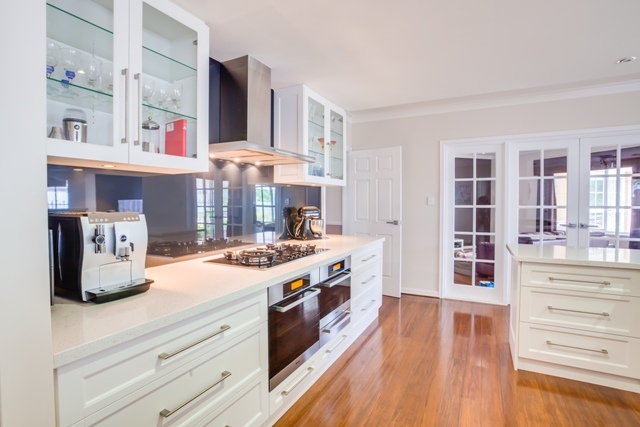 With all this activity, most people want their kitchen bench tops to look great, as well as be durable and easy to clean. The bench top has become the focal point of any modern kitchen. But choosing the bench top that works for you can be a daunting task with so much available today. When you have stone, laminate, granite, marble, steel, timber and concrete to choose from, it’s very challenging to choose the ideal bench top surface for your new kitchen. Your decision often comes down to price, aesthetics and practicality, but wouldn’t it be good if you knew all the pros and cons of every surface so you can make a fully informed decision? Laminate – This synthetic cost effective option is made up of several layers. It’s affordable, durable and versatile, coming in a variety of colours and styles that can emulate a particular natural look like timber or granite. Granite & Marble – Go back to basics and back to nature with these classic surfaces that come in a highly polished or matt-honed finish. It’s visually spectacular, ultra smooth and cool on the fingers. Staron – This beautiful solid surface is a patented blend of acrylic and natural minerals. It’s nonporous and stain resistant and comes in many colours, both matt and gloss. It can also be welded together to form seamless joints. Caesar Stone – This ever popular manmade stone is low maintenance, as well as stain and scratch resistant. It’s non-porous, waterproof, heat resistant and looks fantastic. Stainless Steel – Great for that cutting-edge industrial look and feel, stainless steel is highly durable. However, you must maintain it regularly, as scratching can happen quite easily and smudging can show. Fires that start in kitchens are very common. In the 2010 to 2011 financial year 312 fires started in residential kitchens in Western Australia causing damage estimated at $5,050,700.00. Clean and maintain cooking appliances, exhaust fans and range hood filters. Use an extinguisher if available. A clean home always presents better. It is worth hiring storage and removing any awkward and/or bulky furniture, leaving only what is necessary. Always remember – Less is More! Neutral colours are the way to go when selling as you dont know the potential buyers taste and it will allow the buyer to customise to their taste. If you choose colours to your liking, it could actually cost you the sale. We’ve heard of many ways to help sell your home with a good smell (to give that homely feel) … coffee, a roast, even a cake in the oven but my particular favourite is scented candles. It may not land you the sale as such but candles can be very inviting. When having people through our home during home open we were always asked what the lovely smell was. What more can I say, they look great! I’ve always chosen lillies as they let off a lovely smell and they always look great even when they just start to open. A neat & tidy home will always sell and it will also give a feeling of space. Take the time to make beds properly, arrange scatter cushions appropriately and tidy those cupboards (yes! peeple do look). This tip also comes back to ‘declutter’ – these 2 tips go hand in hand. If your house is small, in particular, you don’t want people to feel claustrophobic so keeping your home neat & tidy and decluttered will ‘open’ your home. Without a doubt make sure you do the weeding before a home open. We all know that weeding is a job that we have to do but most of the time we dont think about a garden that requires weeding, especially a big garden – we just admire how lovely (or not so lovely) its looks. Freshly mowed lawns is also a good idea, again, it will leave your front & backs area looking tidy but smelling a freshly mowed lawn is also quite appealing. If you have a particularly old kitchen, bathroom and/or laundry revamping will no doubt add thousands to your home (possibly a quick sale too!) and you dont need to spend alot; even a faceilft (replacing bench top and doors) can give your old tired kitchen, bathroom and/or laundry a fresh feel. Again, it is a good idea to go neutral. Blueprint Interiors can offer you free advice and we can even supply DIY to save you even more! Please note: speak to your real estate agent before renovating these areas as they are the experts and will be able to advise whether it is worth spending the funds. For the cost of a few hundred dollars you could obtain the advice of a professional such an Interior Decorator. You don’t necessarily need to let them do the work but they should be able to offer you advice custom to your home (i.e. blending the right colours, how to display your furniture etc). Interior Decorators have a natural flare to make things look great so why not add their touch to your home. Note: When hiring an Interior Decorator make sure you ask lots of questions before hiring. For example; how long they have been an Interior Decorator, how much they charge, how much time you will get and don’t be afraid to let them know that you are just wanting to pay for some of their ideas – best to be clear upfront.